The aim of the article is to evaluate the use of intellectual property protection tools to secure innovations in catering companies. 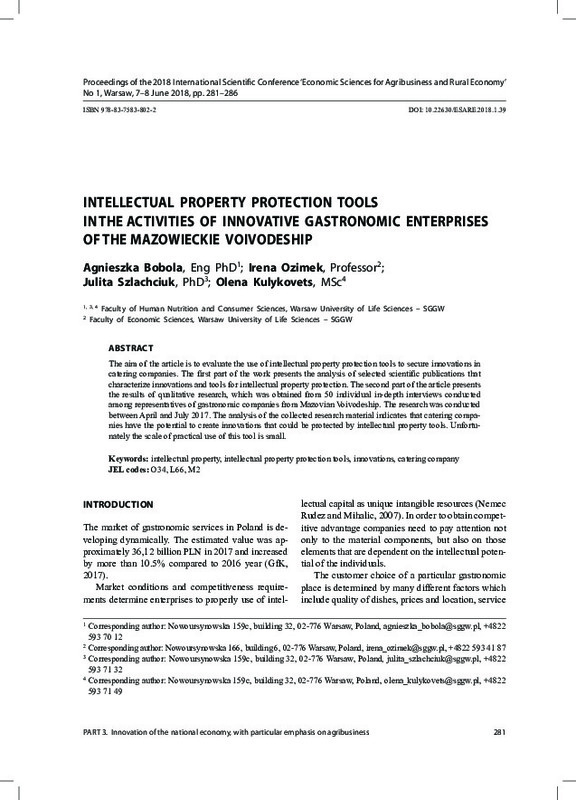 The first part of the work presents the analysis of selected scientific publications that characterize innovations and tools for intellectual property protection. The second part of the article presents the results of qualitative research, which was obtained from 50 individual in-depth interviews conducted among representatives of gastronomic companies from Mazovian Voivodeship. The research was conducted between April and July 2017. The analysis of the collected research material indicates that catering companies have the potential to create innovations that could be protected by intellectual property tools. Unfortunately the scale of practical use of this tool is small.